Ronald Boers, CEO of BOAL Group, stated: "The greenhouse industry is growing rapidly, a development from which BOAL Group is set to benefit enormously. Equistone is the perfect partner for our ambitions and together we will continue to drive the company’s growth plans forward." 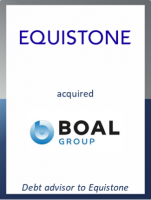 Marc Arens, Partner at Equistone, added: "BOAL Group already has an impressive market position which provides an outstanding foundation for the next phase of growth. Together with its exceptional management team, Equistone will build on BOAL’s strengths and continue its growth strategy." Thorsten Weber, Director at GCA Altium, commented: "BOAL Group is active in an attractive and dynamic market sector and has shown strong growth over the last years. Whilst the selected financing should allow a maximum of flexibility, it likewise reflects the extraordinary growth potential of the group."